Harvest to Hydrosol is a unique book which includes the proven practices of the author, Ann Harmon, including research conducted by the author’s organization, the Circle H Institute. Packed with a wealth of research and personal expertise, Harvest to Hydrosol leads you on a practical and mystical journey of a plant’s transformation into a hydrosol. 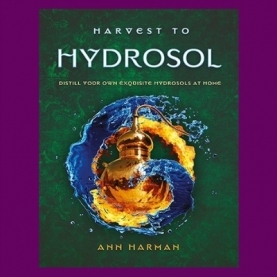 Ann Harman uses her years of experience as an artisan distiller, farmer, and botanist, to guide you in how to easily and expertly distill your own hydrosols. Ann Harman is an organic farmer who has been distilling plants for nearly two decades. Each year she teaches the Art of Distillation workshops, in addition to lecturing on hydrosols both nationally and internationally. Through her organization, Circle H Institute, she conducts research on hydrosols which will one day lead us to a better understanding of these complex waters.